Mont Helena is truly spectacular to behold - a must-see on the Mississippi Mound Trial and one of the state's most photographed landmarks. Though the site may have had as many as three mounds in the past, today only one remains. Currently 26 feet tall, its original dimensions were even more impressive. 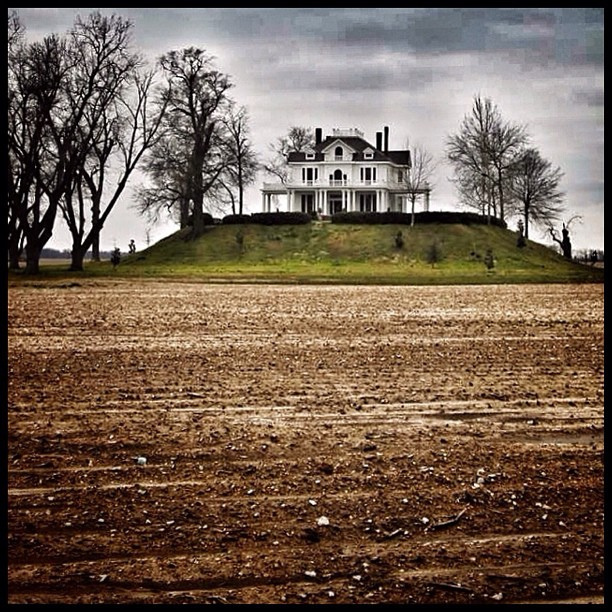 Roughly 10 feet of mound fill were removed in the 1870s prior to the construction of the beautiful Victorian neoclassical home now located on its summit, and flood deposits have likely buried several more feet at its base. Not for lack of trying, professional archaeologists have been unable to pinpoint exactly when the mound was built and what it was used for - only four artifacts have ever been recovered from the site (perhaps adding to its mystique!). Based on a radiocarbon sample that dates the pre-mound ground surface, archaeologists have determined that Native Americans built the mound sometime after AD 1000, probably during the Mississippi Period (AD 1200-1600). It was constructed by alternating layers of clay and sand, a method of engineering that no doubt contributed to its centuries-long structural integrity. Visitors to the site can tour the restored 1870s mansion by reservation or take in a play that dramatizes the romance leading to the construction of the house and the tragedy that ended it.